It's been almost 3 years now since I've been to Malheur NWR and the birds along the way. So I definitely want to spend some time photographing birds in the rimrock, marshlands, and junipers among the sage this spring and summer. I still have several "undeveloped" images from my last trip to Malheur in May 2010. I shoot digital in RAW format and "develop" the immediately obvious "best" photos in my "digital darkroom" and upload them to my pBase photo gallery. Some near duplicates I skip and will either delete or work on later. Cloudy winter days are a good time for that. 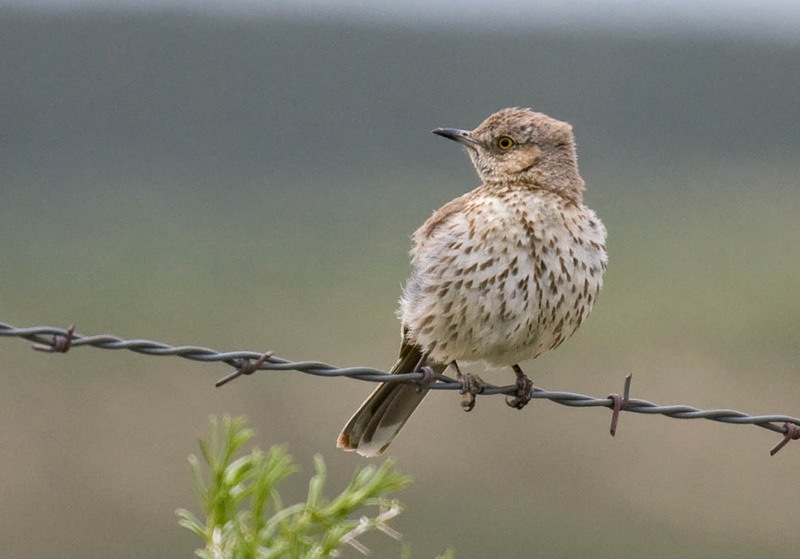 In 2010 I came across an obliging Sage Thrasher at a livestock pen that allowed numerous photos from my car as I used it as a blind. It seemed he was as interested in me as I was in him. I had to keep moving the car to get the best background. And I had to crop this photo rather closely. The green gate on the left side is not too distracting, is it? 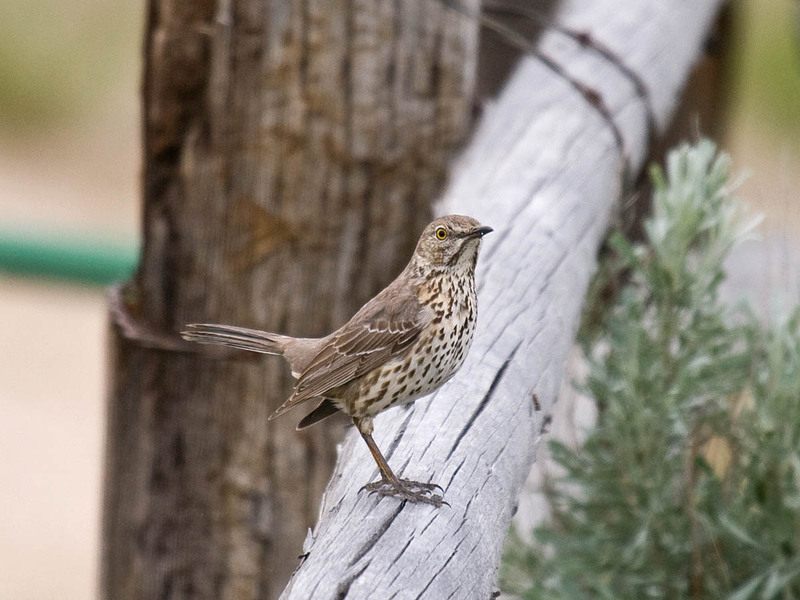 Sage Thrasher. Malheur NWR. May 30, 2010 by Greg Gillson. This bird then moved to the nearby fence line where I got a couple more photos. I thought the following photo showed the tail to great advantage. 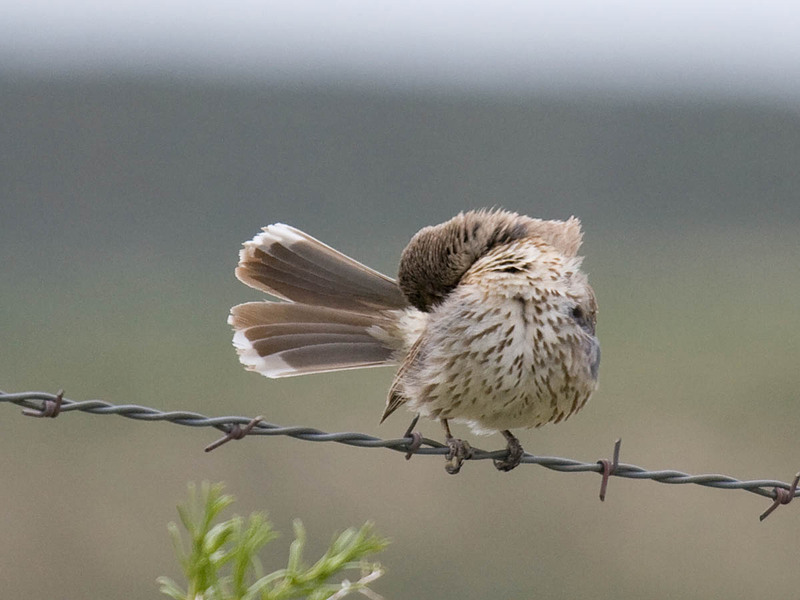 Sage Thrasher preening. Malheur NWR. May 30, 2010 by Greg Gillson. The above two photos are all that I created out of about 10 shots on this date--until now. Once the bird reached the wire fence (above) the bright sky against distant darker hills created quite a distraction. But by cropping rather closely I was able to get the following image, never before seen. 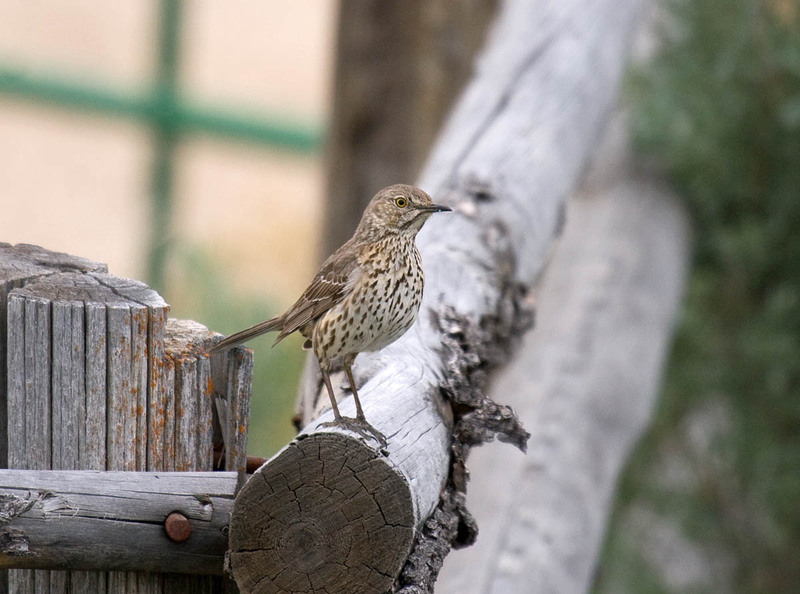 Sage Thrasher songs are one of the characteristic sounds of the Great Basing desert in spring. They sound somewhat like Western Meadowlarks, with a few clear whistled notes within the song. But these are interspersed with garbled bubbly noises, raspy notes, and short trills all thrown together in rapid succession that seem to lack any pattern to make them easily remembered. Fortunately, the only other similar songs you have to remember in the sage desert are Brewer's, Sage, Vesper, and Lark sparrows. OK, let's go back to the wooden fence and see if I can get any more usable shots there. As I said the green gate with its horizontal and vertical bars make a distracting background. But here goes... This next photo has a bit more of the green gate showing, but is still cropped heavily. I would like to show more of the wooden fence, as its texture and shape is so interesting. But I also want the thrasher to be the focal point, which usually means putting more space above the head and in the direction in which the bird is looking. One doesn't have to follow this convention, but is helps make the image more pleasing. I threw away a lot of photo on the left in order to get rid of as much of the green gate as possible and balance the photo. I could have put the bird in the upper right of the frame, but thought it looked out of balance there. There is one more photo I can create. It is actually the first photo of the series. The bird was on a taller pole, and then flew nearer to the wooden fence. I will work this photo up, but I'm not sure whether this is really one that should have been deleted. It's a bit soft in focus on the face and was a bit distant. Well, that turned out better than I expected. Three new photos from an old shoot! I wonder how many other gems I have in "undeveloped" photos saved on my hard drive? I have yet to see this species of thrasher. It has a lot more spots and is more contrasty than the curve-billed thrashers I see here in SE AZ. Nice to see and read about the creative process as you decide how to develop and crop these shots! Sage is the only regular thrasher in Oregon, east of the Cascades. I've seen several Sage Thrashers in SW Arizona (Quartzsite/Yuma) in late winter and early spring (but more Crissal's, Bendire's, and Curve-billed). Great images Greg! 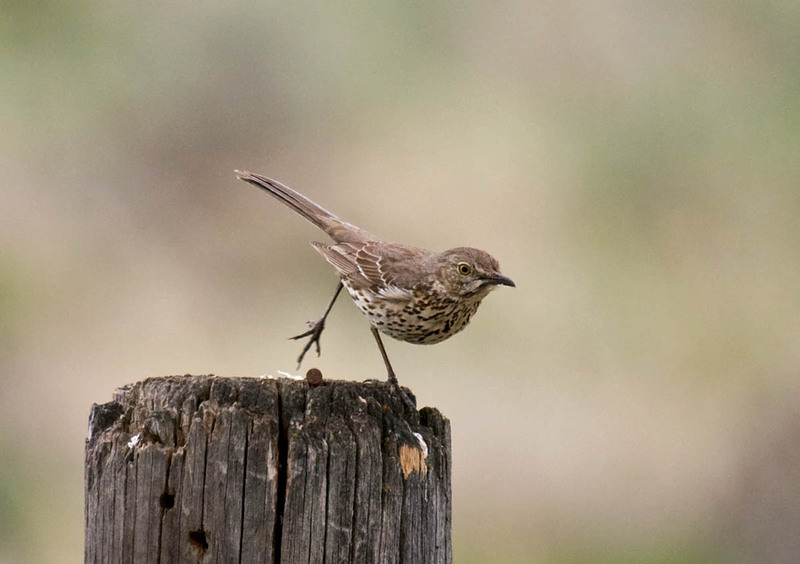 My first Sage Thrashers were out at Malheur. We should organize a BirdingIsFun Malheur adventure this spring! I'm all for it, Robert! Most birders go on Memorial Day Weekend for best chance of eastern vagrants. I'm busy that weekend, so may go a week later. Nice photos Greg. In response to Kathie's comment, we get Sage Thrashers here SE Arizona in the winter, but irregularly. The best local area with habitat they prefer might be the Santa Cruz Flats or Avra Valley. But looking at Christmas Bird Count and eBird data, this isn't the year for them. Strangely, the bulk of the winter population moves about from year to year, never settling in exactly the same place. So some years a CBC with but 7 birds will garner the annual high count, while the next year the annual high will be on a CBC several states away with over 150. Green-tailed Towhees exhibit a shockingly similar pattern of spatial and temporal distribution and variability from year to year. I suspect the bulk of them are wintering farther south in Mexico this year for reasons we may never fully understand. Keep an eye out in March and early April when they start moving through (and can appear almost anywhere, such as your yard). Barring that, I recommend a visit to Malheur National Wildlife refuge to hear them sing. Heavenly. Terrific captures of the photogenic Sage Thrasher! It's always a pleasant surprise to find some decent photographs when reviewing old images. Handsome bird!